So you have tried paddling and you think you have the hang of it, but what now? Well, if you’re interested in completing the Dusi or another endurance marathon, your next step is to register with a canoe club and a union and TuksCanoe Club is the place for you. All the relevant information and forms are available from the TuksSport Reception/Information desk in the TuksSport Centre on the Sport Campus. Once you are a member of TuksCanoe and the Gauteng Canoe Union you will be issued with your four digit race number. Then things can really get going. The next step is to complete your flat water proficiency, via the club safety officer. Then you are all set to do weekly time trials and flat water races. 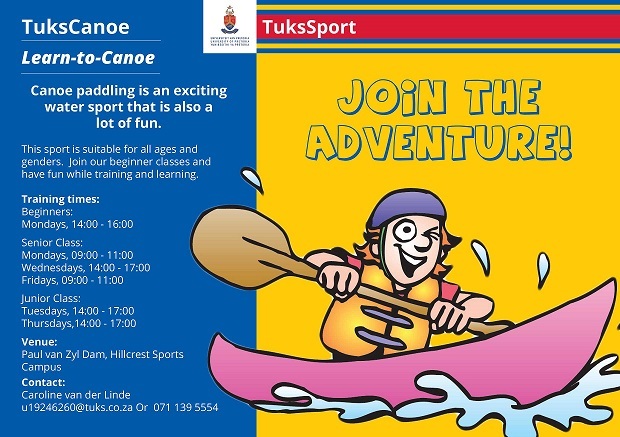 TuksCanoe is a great place to begin or continue your paddling career.